To enlarge an image, click on the thumbnail below. 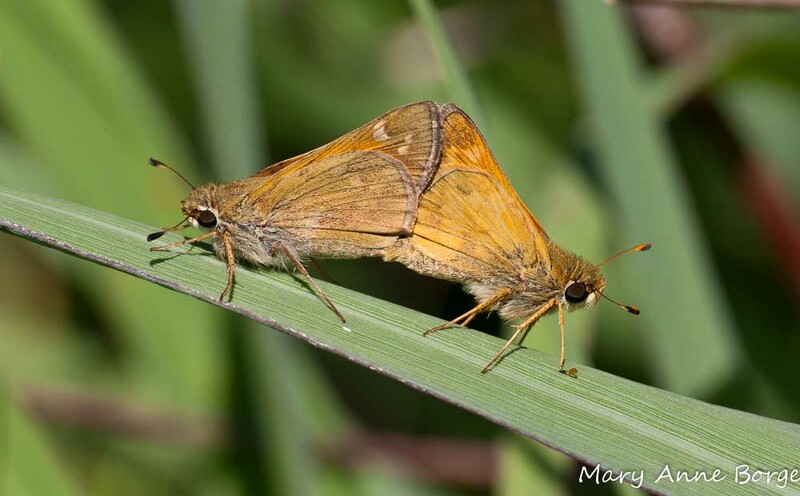 Sachem mating – They met on Mountain Mint! Looking for a deer-resistant pollinator magnet? Mountain Mints are your answer. 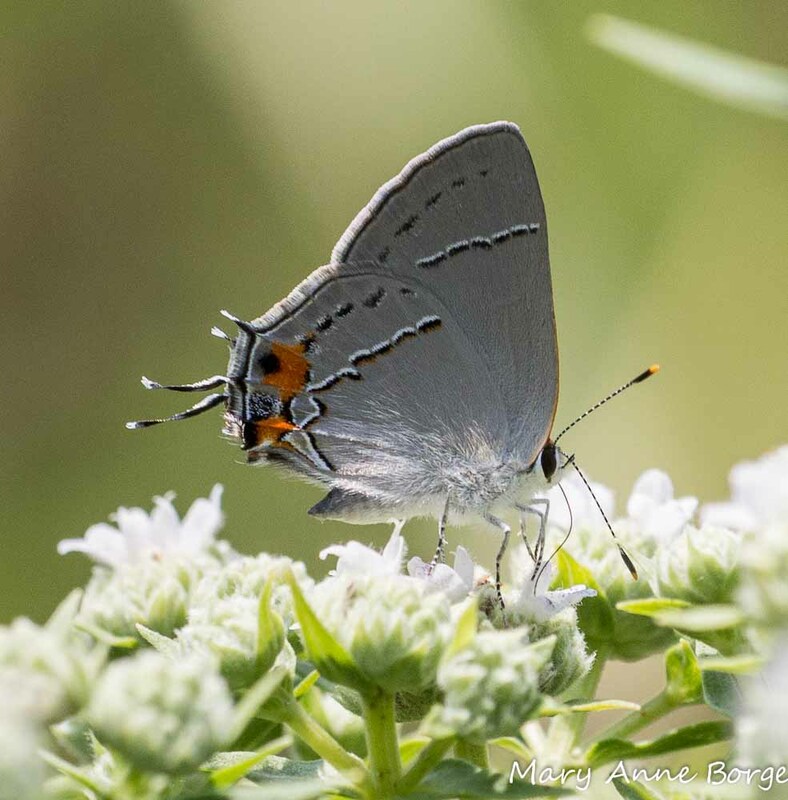 Usually blooming from late June through August, Mountain Mints attract a spectacular assortment of butterflies, bees, moths, and other critters. 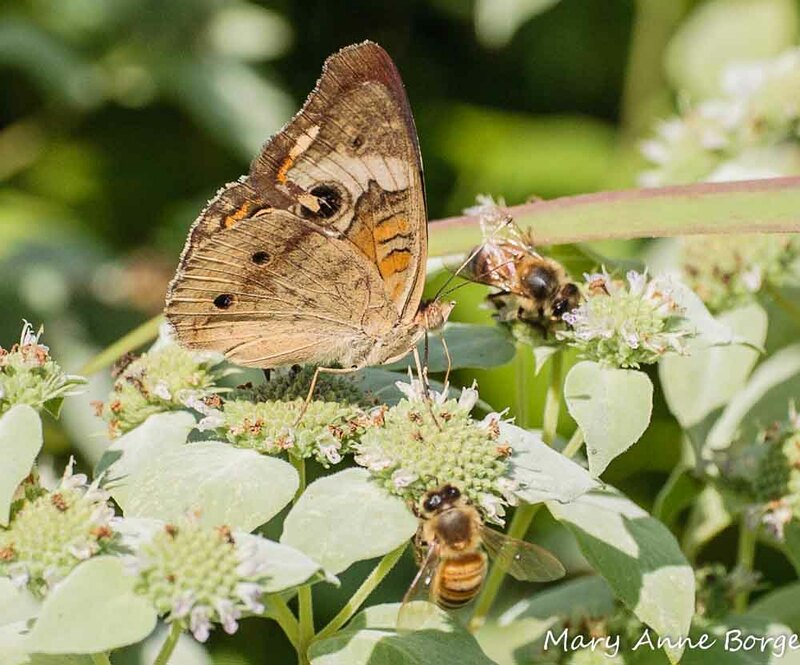 These beneficial insects graze amiably together for nectar, since the profusion of tiny blossoms offered by these plants provide enough food for everyone to dine in harmony for many weeks throughout the summer. From morning until evening Mountain Mints are alive with the dance of pollinators. 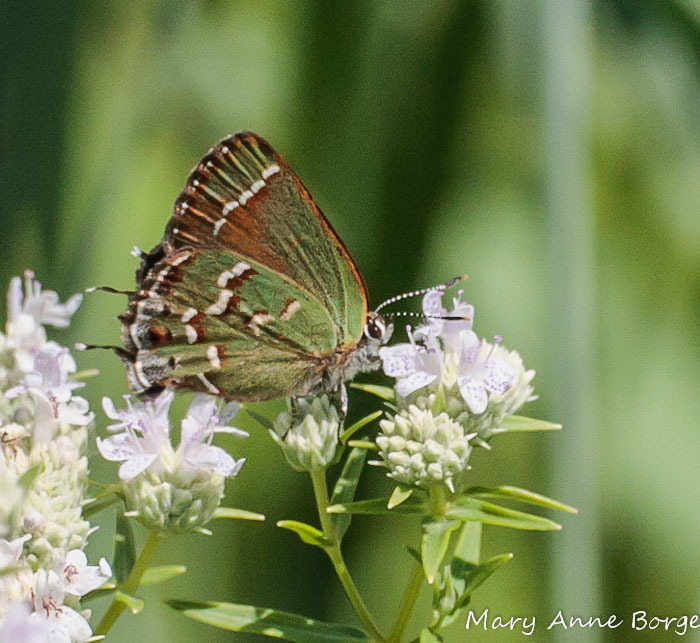 There are several species of Mountain Mints, but my favorites are Short-toothed Mountain Mint (Pycnanthemum muticum) and Hoary Mountain Mint (Pycnanthemum incanum). The genus name, Pycnanthemum, means densely flowered, hinting at the reason that these plants can accommodate so many hungry visitors simultaneously. The foliage of these two species is as showy as the flowers, enhancing their visual appeal. Plants are all about surviving and reproducing, and Mountain Mints are among the plant species whose survival strategy is to produce clusters of diminutive flowers, together forming a showy inflorescence, a strategy that has evolved to attract insects as assistants in the pollination process. Individual flowers in each cluster bloom progressively over many weeks, increasing each plant’s chances for successful reproduction. This works out really well for their pollinator partners, who are looking for a continuing reliable source of food. Short-toothed Mountain Mint grows to a maximum height of about three feet, topped with round heads of tiny white flowers smudged with bright magenta. The plants are truly ‘densely flowered’. A soft velvety bed of pale blue-green foliage frames the blossoms. Rub or crush the leaves and you’ll be rewarded with a scent that confirms that this is a mint family member. 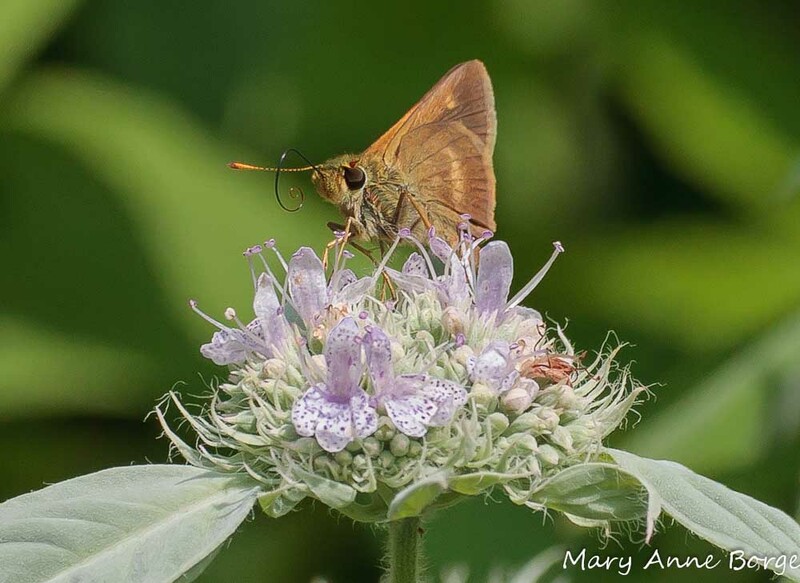 Short-toothed Mountain Mint can tolerate part shade to full sun, and likes moist but well-drained, average soil. Hoary Mountain Mint, as the name implies, has foliage very similar to Short-toothed Mountain Mint, with the leaves just below the flower heads looking as if they had been lightly but evenly dusted with powdered sugar. Each delicate flower is white with a sprinkling of tiny purple spots. The flowers grow in rounded heads much like Short-toothed Mountain Mint, but the blossoms are somewhat larger, growing in multiple tiers on each stem. The branching habit is open and graceful, showing off the layers of flowers, and providing easy access to their many visitors. This species grows to a height of 2-4 feet, prefers sun, and average to dry soil. Virginia (Pycnanthemum virginianum) and Narrow-leaved (Pycnanthemum tenuifolium) Mountain Mints are also good garden candidates. 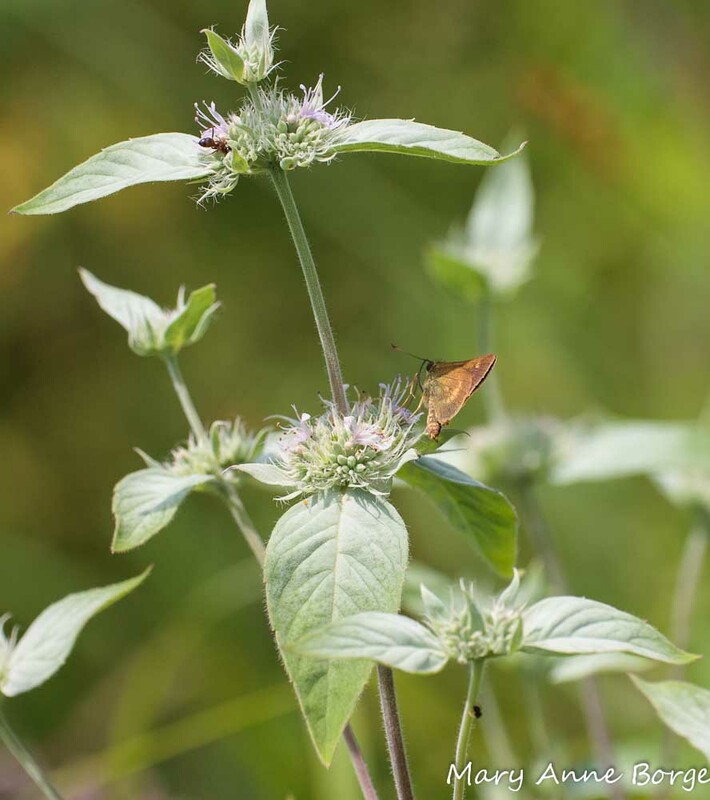 Narrow-leaved Mountain Mint grows to a height of 1-3 feet, while Virginia may achieve a slightly taller stature, depending on growing conditions. 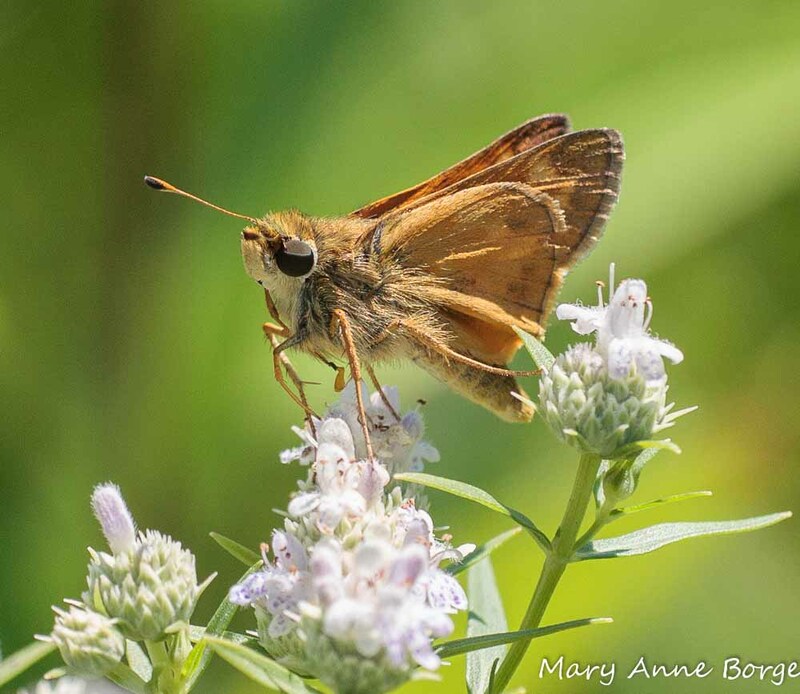 The seemingly endless supply of nectar makes Mountain Mints a great option for attracting butterflies. 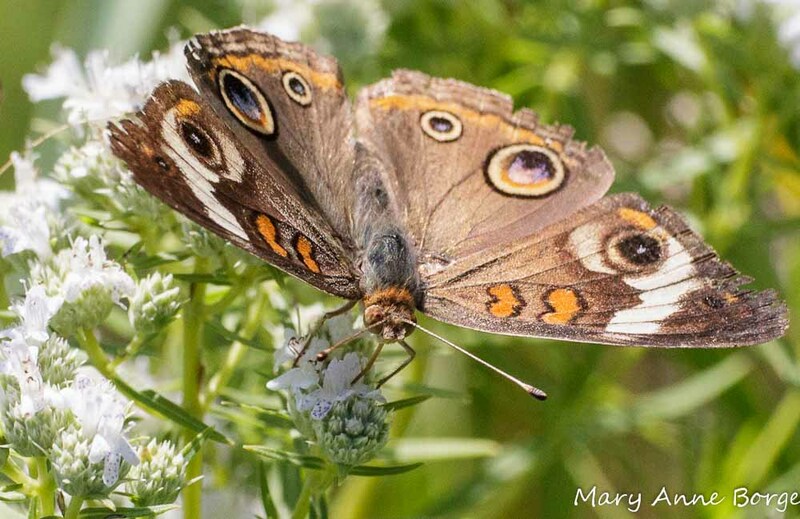 Short-toothed, Narrow-leaved and Virginia Mountain Mints all attract small to medium-size butterflies; expect to see hairstreaks, blues, Common Buckeyes, ladies and smaller fritillaries. 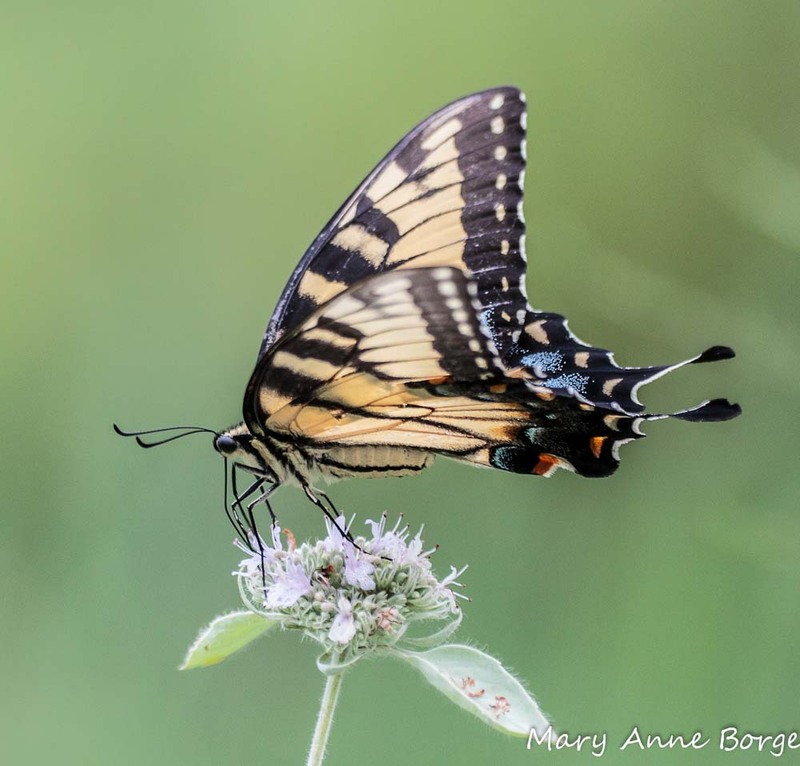 Hoary Mountain Mint flowers are large enough to also accommodate larger butterflies, like some of the swallowtails. 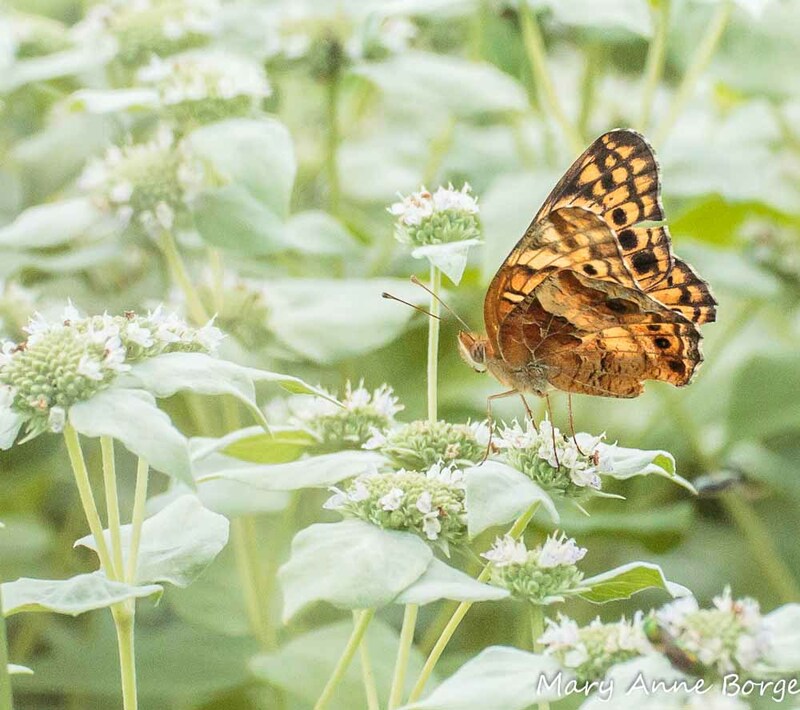 If you have a vegetable garden, you might consider planting some Mountain Mint nearby. Good nectar producing plants like these attract many bee species that will help increase your garden’s yield. Because of their strongly fragrant foliage, foraging deer reject Mountain Mints. In fall the flower heads dry to a dramatic steel gray, and can be an eye-catching addition to a garden in winter. 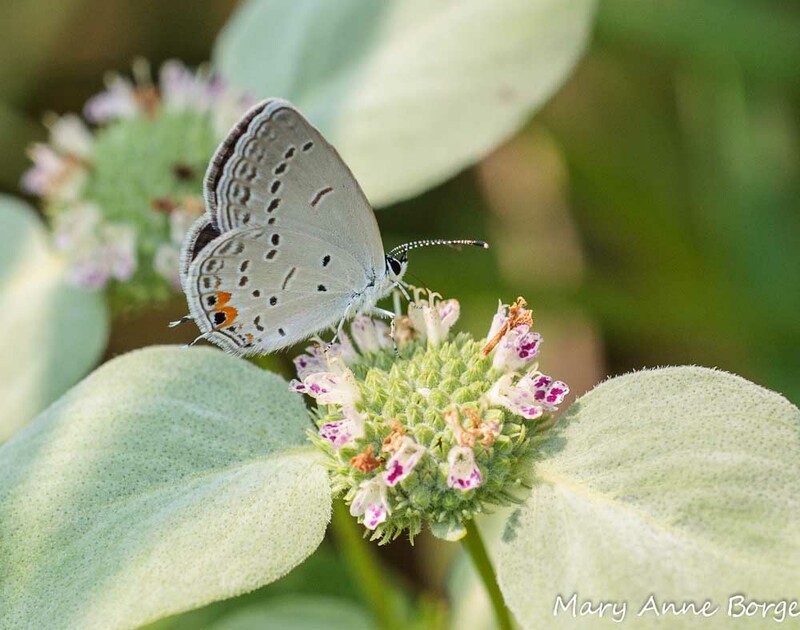 This entry was posted in Butterflies, Gardening for Wildlife, Native Plants, Other Insects and Spiders, Photo Galleries and tagged Hoary Mountain Mint, nature, Pycnanthemum incanum, Pycnanthemum muticum, Short-toothed Mountain Mint by Mary Anne Borge. Bookmark the permalink. Just to see the various mountain mints in the meadow at Bowmans, with their plethora of butterflies and bees, as so beautifully illustrated here, is to love them and to want to have them in one’s own garden. I agree, Monica! I have mostly shade, but there’s one spot that gets a few hours of afternoon sun. I tried some Short-toothed Mountain Mint there, and it’s doing great. It’s always covered with tiny sweat bees, and there are other visitors, including some of the smaller butterflies like Summer Azures. Also some Scoliid wasps, which I just learned help to keep Japanese beetles in check by providing the beetle larva as food for their own larva. So cool! I have just the place to plant some of these. Will have to wait till next year though so I can kill off the weeds first! Why wait? Just mow or cut the weeds as short as you can, and cover the area with several layers of newspaper, making sure there are no gaps when you put the sheets of paper next to each other. Then cover the newspaper with soil, and you’re ready to plant. No messy, expensive, toxic chemicals, and the newspaper gets recycled at the same time.